Allison Eden Studios is the country's leading glass tile supplier for commercial and residential interior decor. We design custom stained glass mosaics for commercial and residential spaces worldwide. See our work on display at Bloomingdales. 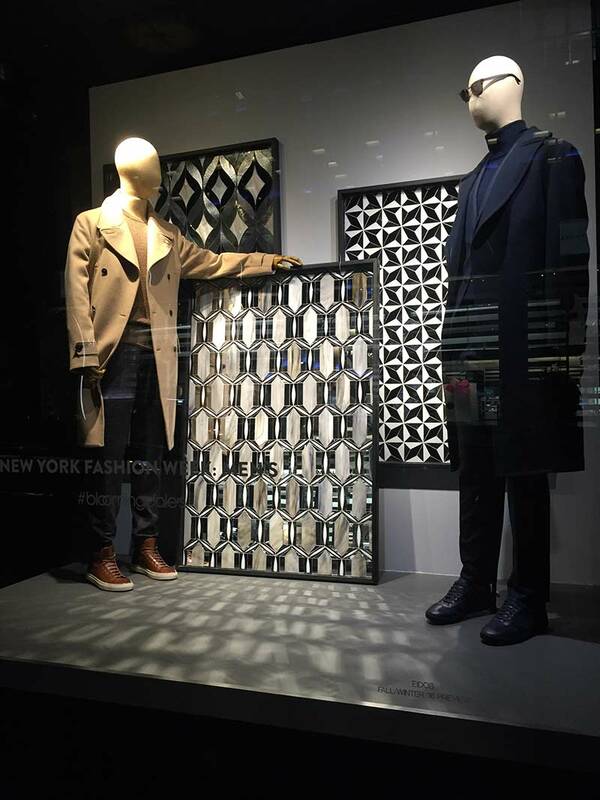 NEW YORK - July 13, 2016 - PRLog -- Allison Eden Studios is proud to announce the launch of its Men's Fashion Week display in the windows and entrances of Bloomingdales New York City flagship store. Allison Eden Studios worked with the visual merchandising team at Bloomingdales to incorporate their unique one of a kind mosaic creations as the backdrop for the fall collections of Bloomingdales designers featured in New York City Men's Fashion Week, including, Calvin Klein, Marc Jacobs, Michael Kors, Todd Snyder, Hickey Freeman, Eidos, Billy Reid, Ralph Lauren, Ovadia and Sons, Public School, Alexander Wang, Theory and Rag and Bone.